When Betfair introduced lay betting it was a sort of revolution for punters. Before that you could only place a back betting on bookies such as Paddy Power. Before i go deep into lay betting let’s first understand what is back betting which you normally do on a typical bookmaker site. Let’s take an example of India v SL 1st ODI match. William Hill are offering 1.67 for India. Let’s say you back India with £100 and India wins the match. You will make £67 profit on £100 stake. It’s all simple to understand as you do it without thinking. So what’s going on here? When you are backing India you are effectively saying that “I want India to win with 1.67 odds”, if India wins you win. You backed India but there must be someone to accept that back bet, who is that? Well that’s the bookie. Bookie accepts your back bet by laying the bet. So the bookie here is the layer. Bookie is laying the bet in this scenario. As you can see the lay betting already exists but it’s only the bookie who can lay not us. Betfair Exchange is a platform which lets punters bet against each other. It’s a new concept and on the exchange Betfair doesn’t act as bookie. They just charge a commission when you win, you pay no charges when you lose that’s all they do. In lay betting instead of backing a bet you lay it. Which effectively means you are acting as a bookie and accepting the back bet from the backers on the exchange. Let’s take the India v SL example again. 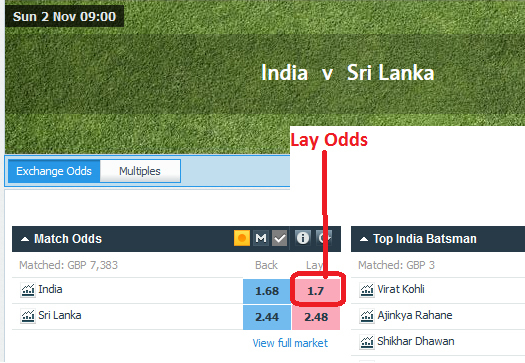 On Betfair exchange India’s lay odds are 1.7 – see the odds in pink. The odds in blue are back odds. When you lay India with 1.7 you are effectively backing India to lose. If India loses the match you will win. If India wins you lose. “When you lay a bet and team loses you win” – Just remember this sentence in the beginning. After some time you will get hang of it and it will be all clear. In back betting you win when team wins. In lay betting you win when team loses. A clever question here would be, hey hang on. Why so much fuss. Why not just back Sri Lanka instead of laying India. Why to create so much confusion. You are right. That’s another way to achieve the same which is winning when India loses. However it’s not that simple when it comes to doing math which I’ll explain later. And don’t forget the one click scalping which can’t be done without lay odds. In lay betting your make same profit as your stake which is also termed as “Backer’s Stake”. Basically you keep the backer’s stake which is exactly what traditional bookies do. Remember the back odds of 1.67? When you backed India with £100 it’s the backer’s stake. When India loses bookie pockets this stake and you lose £100 and bookie wins £100. Bookie here is the layer so layer’s winnings is £100 which is basically backer’s stake. In this process of backing and laying two parties entered into a transaction. First party is backer who placed a back bet of £100 @ 1.67 and the second party is layer )or bookie who layed the odds or accepted the backer’s bet @ 1.67. If backers loses his money will go to layer. If layer loses then his money will go to Backer. As I explained above in lay you win the backer’s stake. So if you layed India with £100 @ 1.7 then you win £100 if India loses. This £70 will go to backer who has backed India to win @ 1.7. I hope it’s all clear now! Drop a comment below if you require any further clarifications. People in this forum are lucky . All the info you are giving will help and understand how betting price works . Good one, will remember your local bookie’s jargon. Is it not better to back at high odds the underdog rather than lay the superior player in particular to tennis? I am asking this question as to recently concluded ATP Basel in one of the matches the match between Istomin and Federer the odds at the start were 1.09 and 20.Rather than laying Federer i backed Istomin and luckily he broke federer serve in the first set and won 1st set too and i got a handsome profit(thanks to you Bhai).I am wondering if i had laid with the same amount i backed i would not have greened up to that profit,although when i squared up profit ultimately its like laying only. I also wana ask like when we lay low is it not good if the odds move in favour instead of greening up take the profit by hitting the cash out button? Please explain me bhai, in some doubts about these aspects. Bhai give Ur Final prediction for Sl Vs Ind? Fast …. Am Waiting?? Munna Bhai, how to verify betfair account and australian wallet? Munna Bhai i need your contact number ! Munma bhai can u plz illustrate what is ‘hedge’? You will have to do some math to calculate odds and stakes in such a way that you make profit on both side. If it is Test match (3 outcomes) then you have to do the same on 3 sides. Munna bhai i undrstand point 1 and 2., but how can u earn profit by backing both sides? that post has everything you need to know about this strategy. Read that like Gita. Munnaji iam very big fan to you,betfair not supporting inr,how to I bet from India to betfair,please tell me the process of currency conversion fee avoidance. You can use USD. While depositing or withdrawing you will use USD.